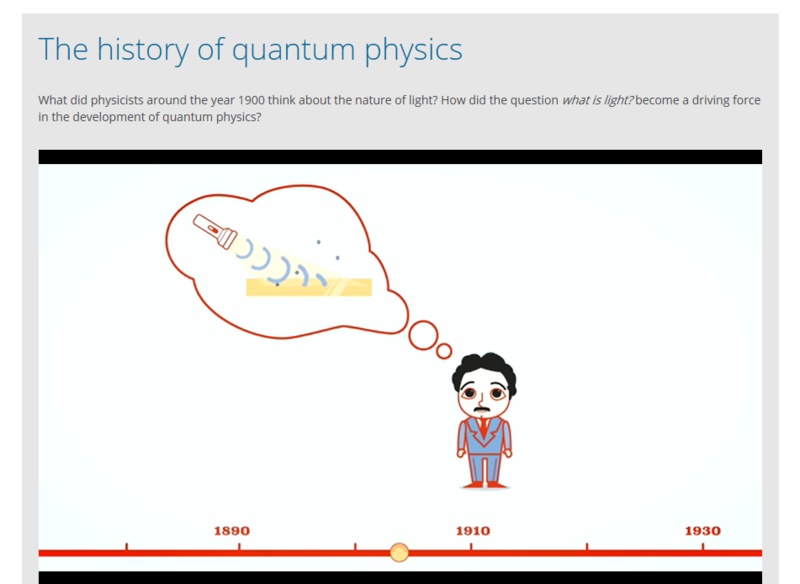 ReleQuant develops digital, research-based learning resources in general relativity and quantum physics for upper secondary physics. Practicing physics teachers as well as physics teacher students are included in the project through ReleQuant Competence. The programme "Kvantefysikk" (The English version "Quantum physics" can be found here) was released on October 20th, 2016, after four rounds of classroom trials. describe physical principles behind medical examinations such as X-rays,.. The first round of testing that included the first modules on quantum physics started in spring 2014. In spring 2017, the module on general relativity is tested for the third time while the finished programme in quantum physics is used for the first time. Kersting, Magdalena (2018). General Relativity – Why high school students should learn about Einstein’s most revolutionary idea. Titan.uio.no. Vinjusveen, H.M. and Bungum, B. (2016). ‘From the cat’s point of view’: upper secondary physics students’ reflections on Schrödinger’s thought experiment. Physics Education 51 (5), 055009. Bungum, B., Angell, C., Tellefsen, C.W. and Henriksen, E.K. (2016). Physics students’ understanding of fundamental principles in quantum physics. In J. Lavonen, K. Juuti, J. Lampiselkä, A. Uitto & K. Hahl (Eds. ), Electronic Proceedings of the ESERA 2015 Conference. Science education research: Engaging learners for a sustainable future. Helsinki, Finland: University of Helsinki. Angell, C., Bungum, B., Bøe, M.V. and Henriksen, E.K. (2016). Relativitetsteori og kvantefysikk i vgs: Forskning og utvikling av et skoleprosjekt. Fra Fysikkens Verden Nr 1 - 2016, pp. 21-25. Bungum, Berit and Tellefsen, Cathrine Wahlstrøm (2016). Bruk av språk og diskusjoner for å fremme elevers forståelse i kvantefysikk gjennom digitale ressurser. Nordisk tidsskrift for pedagogikk og kritikk 2 (1). Angell, Carl; Bøe, Maria Vetleseter and Henriksen, Ellen K. (2015). Kva er lys, eigentleg? Kva seier naturvitskapen, og kva tenkjer elevane? Naturfag 2/15, s. 10-13.